On average Americans begin drinking coffee type drinks, like espressos and lattes, at the age of 18. This is why they are typically available in multiple locations, even in a one block radius. With all the competition out there, it is extremely important to know where to purchase your espresso machine parts. Nelson Appliance provides a wide selection of espresso machine parts. Espresso machines themselves can be costly with their upkeep. Wiping the machine between uses, and breaking them down completely at the end of the day for deep cleaning them can help keep them in prime condition. But in reality, no matter how well you treat your machine, preventing all problems is unrealistic. With busy mornings filled with people rushing off to work or classes, craving their morning caffeine fix, your machine is in constant use. Lunch and dinner aren’t much different thanks to America’s addiction to caffeine. Espresso with dessert is not just a trend desired by a few, but by a majority. Americans love the rush of caffeine propelling them ever forward. The number of espresso available in a single drink is almost unlimited. To have a properly working espresso machine is paramount to successfully launching your work day or school day in today’s world. The funny thing is espresso machine parts are not as easy to come by as you would think. It is also important to order parts from a company that can provide you the item as quickly as possible, to keep your “habit” from taking a hit. This is why Nelson Appliance is a location that is dedicated to offering a huge array of espresso machine parts. Krups Espresso Machine Boiler Barista Seal MS-5015004. 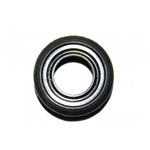 Black rubber gasket fits Krups super automatic espresso machines. Krups Espresso Machine Power Button (Silver / Gray) MS-0675088. Plastic power button fits Krups super automatic espresso machines. Krups Espresso Machine Power Button (Black) MS-0675141. Plastic power button fits Krups super automatic espresso machines. Krups Espresso Machine Frothing Nozzle MS-0A01531. This attachment part mounts on the steam arm and provides frothing pressure to fit many Krups automatic espresso makers. Krups Espresso Machine Flow Meter MS-0A01717. Flow Meter / water sensor fits Krups super automatic espresso machines. 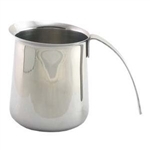 Krups Stainless Steel Frothing Pitcher XS5012 for Espresso / Capuccino Makers. Original 12 Oz. Krups pitcher is ideal for frothing milk. Krups Espresso Machine Frothing Nozzle Kit MS-623107. 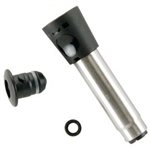 This kit includes frothing nozzle, mounting hub and seal. This part replaces MS-622268. To fit many Krups espresso makers. Krups Espresso Machine Boiler Upper Piston and Seals MS-0697072. Plastic Upper Piston with gaskets fit Krups super automatic espresso machines. 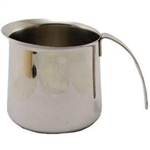 Krups Stainless Steel Frothing Pitcher 20 Oz. Krups Stainless Steel Frothing Pitcher XS5020 for Espresso / Capuccino Makers. Original 20 Oz. Krups pitcher is generous size for frothing milk.